Of the most general interest is the download activity. 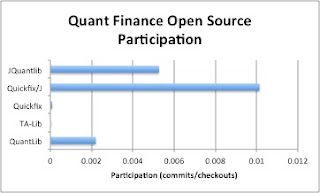 Quantlib is clearly the most popular one. In perspective, the downloads for quant finance is actually quite limited. Consider the example of an end-user-oriented stock market app (JStock). 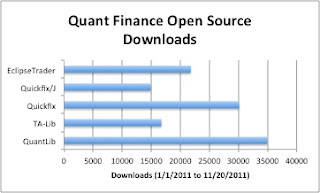 The downloads far outpaces even Quantlib. In terms of code complexity, it is difficult to compare apples-to-apples when the projects are written in different programming languages. Quantlib (written in C++) is the largest followed by TA-Lib (written in C). Quickfix has several flavors in terms of host programming language and version of the FIX protocol supported. The charted version is C++ (non-.NET). For reference, the Python and Ruby versions are 117kloc and 87kloc. The .NET version seems to be the center of much activity in terms of supporting new versions of the protocol and perhaps functionality. 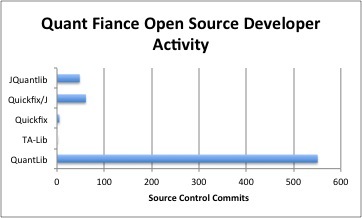 There are 152kloc for supporting FIX44 alone and 893kloc of C# code overall. Now to the interest parts. 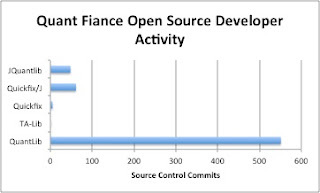 The developer interest as measured by source code downloads from version control (i.e., people getting the most recent, bleeding edge versions) appears to mirror the downloads. The developer activity (in terms of developers sending back patches, feature enhancements, etc. 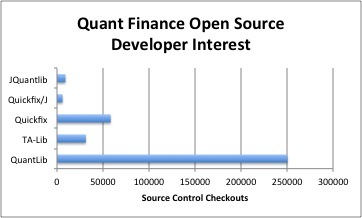 to the Sourceforge project) is all over the map. Some of the newer projects are just beginning to pick up some steam. For some of the more mature systems, activity is petering out. I am also comparing commits (checkins) to checkouts. Over here, the difference between a new project with lots of energy and a more mature one clearly stands out. 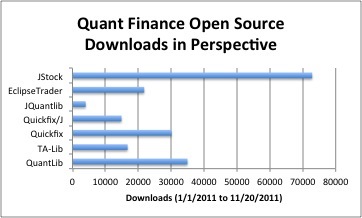 One more data point of note not shown in the above charts is the source of all the downloads. For a couple of them, India is ramping out, even exceeding US downloads in a few time frames. This is consistent with my previous sampling of keyword ad CPCs. I know the market generates some amount of interest in China, but the interest from India appears to be more serious (developer downloads, high CPC and keyword search volumes). Sounds like there will be a certain amount of competition forthcoming.